1.) 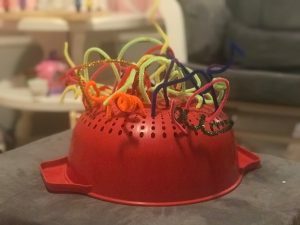 Make a noodle bowl with pipe cleaners and a strainer. This is a great motor activity for your tot and maybe even a stress reliever for mom! 2.) Color! You can never go wrong with the classic coloring book and crayons. Just make sure your little doesn’t eat the blueberry blue! 3.) Make a sensory jar. Add glitter, water, bubbles and whatever else you’d like to mix up to grab that small human’s attention. Just make sure the lid is on tight! 4.) Build a fort! Another classic that stands the test of time. 5.) Blow some bubbles! A great time for your little and cleanup is a breeze. 6.) Pretend to Cook! At this age, your tot’s imagination is gaining speed. Pull out the pots and pans and plastic ware and prepare a pretend meal. 7.) Playdough! 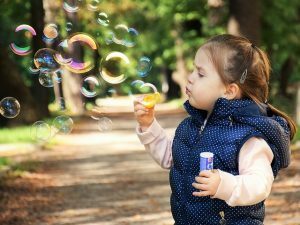 This activity will last you through many of the early years. Just make sure it doesn’t become a snack. 8.) Sort colorful craft pompoms. This is another great sensory activity and will also help your little learn colors. 7.) Clean! Yes…we’re serious! Give your little a pretend broom and sweep the floors. 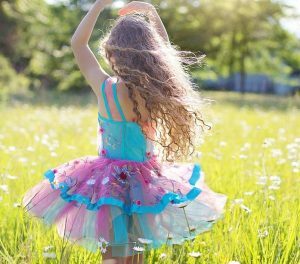 You’ll be surprised how much fun it will be for him/her AND you’ll be teaching a great habit. 8.) Have a dance party! See what moves that little person is working with. Check out this Newsymom recommended playlist.